We invite you to explore India - the Land with infinite beauty ! Whether you soar high into Himalayas or peer under the ruins of the Ancient monuments dotting the landscape of India, you will cherish the experience long after your visit ! This India Travel Guide on Poovar Island is free from any commercial interest! This site is dedicated to promote India - the vast subcontinent, its glorious past, magnificent landscape and its infinite variety. 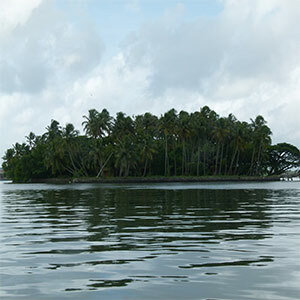 Island, beach, backwaters, river and sea - holiday in Poovar, Kerala offers all at one go. Located 30 kms from Trivandrum is Poovar, a serene place; rich in greenery, culture and magnificent colors. This blissful paradise is ideal to escape on a weekend or makes for a fantastic stop-over honeymoon destination and even ideal for a short family outing. Poovar (meaning a stream of flowers) is in Thiruvananthapuram district of Kerala. It is a must-stop destination for vacationers who visit Kovalam Beach in Trivandrum, Kerala. From Kovalam, the small coastal fishing village is just 12 kms away. For those living in the border areas of the state of Tamil Nadu and Kerala, Poovar is close by. Nearest Airport: Thiruvananthapuram International Airport. Daily flights to all the major cities in India and abroad are operated by major airlines. Nearest Railway Station: Thiruvananthapuram Central Railway Station. Poovar is well connected by train to all major cities of Kerala and rest of India, especially southern states of India. After alighting from airport or station, tourists can reach Poovar by taking a taxi or bus ride which roughly takes about 45 minutes to cover around 32 kms. Knowing a bit of the past of Poovar helps you feel connected with the place, appreciate and enjoy the environment even better. Poovar marks the end of Kerala territory. The River Neyyar separates the Poovar beach and the Arabian Sea. The place is accessible by boat. Moosa Maricar, a rich and aristocratic business man in Poovar provided shelter and assistance when Marthanda Varma Maharaja sought shelter in Poovar. The red flowers of the Kovala trees standing along the Neyyar riverbanks lend the name to the island. The place was a trading center for spices, sandalwood, ivory and timber, even during the time of King Solomon. Poovar has been one of the ancient Muslim settlements (around 1,400 years ago) along the western coast of India. The main mosque is believed to be built by Malik Ibn Dinar (an Arab scholar) who also introduced Islam in the region. The beauty of Poovar is accentuated by the Arabian Sea on the East and the majestic towering Ghats to the west, opening out to stunning beaches. Poovar is highly popular with tourists who favor a quiet and tranquil destination. Being a small village, the movement of local population is very limited. Tourist attractions of Poovar include spectacular scenery, the sea and sand and the pleasant weather that is experienced during most part of the year (November to February). A trip during the monsoon months during May-September is likely to force you to stay indoors and enjoy the incessant downpour. Poovar Beach is a prime attraction. Most accommodations in Poovar provide excellent view of the sea. Though the sea isn't favorable for swimming, sitting on the golden sands, feeling the warmth of the sand, and enjoying the spectacular view of the dancing waves is a sight to behold. Walk along the shores and take in the serene ambience, watch the waves lash the shores and distant fishermen sailing on the catamarans. Rows of coconut trees, banana plantations are an integral part of Poovar. This is the place to enjoy the sound of silence and feel refreshed. No shops, no eateries, no crowded beaches insulates Poovar from stresses and strains of city life. In-house Ayurvedic centers and spa in the island resorts maximize the experience. Ayurvedic massages provide the much needed relaxation, both physical and mental. Opting for a massage in a tranquil setting helps release tension, stimulate blood circulation and energize the whole body. Cruising to the fishing village is yet another favorite activity in Poovar. Tourists gain first-hand experience about the lifestyle of fishing community and also gain insight into the day-to-day activities of the fishermen. Poovar offers a unique opportunity to engage in a thrilling fishing expedition. A leisurely walk around the sleepy hamlet gives a chance to explore the culture and experience the magnificence of the scenery all around. Tourists can choose to stay in traditionally styled land cottages or in eco-friendly floating cottages. Tourists looking for added excitement can choose hotels that have water sports facilities, indoor games, fitness equipment, cookery classes, outdoor barbecue etc. Backwater cruises to neighboring fishing villages and visits to a century old martial arts village are other options. Wind up Poovar tour with the sunset cruise. Bandipur National Park - Paradise for wildlife. Bannerghatta National Park - Animals in their natural habitat. Kabini Resort - Forest retreat a few hours from Bangalore and Mysore. Mangalore - A triangular city with a summit to the South. Alappuzha - Palm fringed canals, lazy lagoons and water locked towns. Munnar - Emerald green tea estates. Silent Valley - Sairandhrivanam, meaning forest in the valley. Wayanad wildlife sanctuary - Holiday Resorts, Ayurvedic Rejuvenation centers and more.